Inspiring Motion Laguna exists to be your resource for Pilates, Gyrotonic and BodyFix Method. 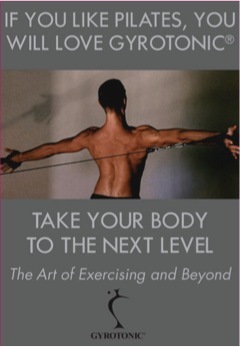 If you need to to strengthen, realign, balance or rehabilitate your body and mind, Inspiring Motion Laguna is for you. Want to increase your core strength and increase your range of motion? Do you have chronic pain in your hips, knees, back, shoulder or feet? Do you have an injury or post-surgery that needs rehabilitation? Do you want to increase your range of motion? GYROTONIC®, PILATES and BODYFIX METHOD® is the key to regaining your strength, flexibility and becoming pain-free again! Not sure where to start? Check out our INSPIRING MOTION LAGUNA Smörgåsbord and get a taste of a few of our services! You can also watch a feature about GYROTONIC and the creator, Juliu Horvath, here. There are no fees, no commissions, or costs on your part whatsoever. You keep %100 of any profit or business you gain from our service. There really is nothing to lose, and plenty to gain in more sales and business. I am 67 yrs old and have a bulging disc problem that flares up if I don’t use careful body movement keeping the spine in a neutral position. Can your method help me with this condition? Some of the video I’ve watched scares me a bit with the amount of movement at the waist. Would you kindly advise me on this? Thank you! Hi Kristi: Yes we can help you. Please call our studio at (949)283-1055 so that we can discuss your condition and set up an appointment to meet you. Please call our studio for an appointment. Telephone number is 949-283-1055. We look forward to working with you! I have moved back to California… Sausalito… and need a recommendation for a well-trained pilates instructor. Thoughts? Hi Alice: I am unable to recommend a Pilates instructor in Sausalito. If you are ever in Laguna Beach, please be certain to come by the studio. We would love to say hi!